This article is about the former region in France. For other uses, see Aquitaine (disambiguation). Aquitaine (UK: /ˌækwɪˈteɪn/, US: /ˈækwəˌteɪn/; French: [akitɛn]; Occitan: Aquitània; Basque: Akitania; Poitevin-Saintongeais: Aguiéne), archaic Guyenne/Guienne (Occitan: Guiana), is a historical region of France and a former administrative region of the country. Since 1 January 2016 it has been part of the region Nouvelle-Aquitaine. It is situated in the south-western part of Metropolitan France, along the Atlantic Ocean and the Pyrenees mountain range on the border with Spain. It is composed of the five departments of Dordogne, Lot-et-Garonne, Pyrénées-Atlantiques, Landes and Gironde. In the Middle Ages, Aquitaine was a kingdom and a duchy, whose boundaries fluctuated considerably. There are traces of human settlement by prehistoric peoples, especially in the Périgord, but the earliest attested inhabitants in the south-west were the Aquitani, who were not proper Celtic people, but more akin to the Iberians (see Gallia Aquitania). Although a number of different languages and dialects were in use in the area during ancient times, it is most likely that the prevailing language of Aquitaine during the late pre-historic to Roman period was an early form of the Basque language. This has been demonstrated by various Aquitanian names and words that were recorded by the Romans, and which are currently easily readable as Basque. Whether this Aquitanian language (Proto-Basque) was a remnant of a Vasconic language group that once extended much farther, or it was generally limited to the Aquitaine/Basque region is not known. One reason the language of Aquitaine is important is because Basque is the last surviving non-Indo-European language in western Europe and it has had some effect on the languages around it, including Spanish and, to a lesser extent, French. Under Augustus' Roman rule, since 27 BC the province of Aquitania was further stretched to the north to the River Loire, thus including proper Gaul tribes along with old Aquitani south of the Garonne (cf. Novempopulania and Gascony) within the same region. In 392, the Roman imperial provinces were restructured as Aquitania Prima (north-east), Aquitania Secunda (centre) and Aquitania Tertia, better known as Novempopulania in the south-west. 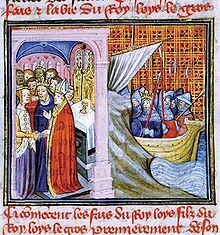 During the three hundred years that the region was ruled by the Kings of England, links between Aquitaine and England strengthened, with large quantities of wine produced in southwestern France being exported to London, Southampton, and other English ports. In fact, so much wine and other produce was being exported to London and sold that by the start of the Hundred Years' War the profits from Aquitaine were the principal source of the English King's income per annum. ^ "Et 3 Calend Augusti habuit concilium magnum in Aquis, et constituit duos filius sans reges Pippinum et Clotarium, Pippinum super Aquitaniam et Wasconiam)". Wikivoyage has a travel guide for Aquitaine. The Aquitanians were a people living in what is now southern Aquitaine and southwestern Midi-Pyrénées, France, called Gallia Aquitania by the Romans in the region between the Pyrenees, the Atlantic ocean, and the Garonne, present-day southwestern France. Classical authors such as Julius Caesar and Strabo clearly distinguish them from the other peoples of Gaul, and note their similarity to others in the Iberian Peninsula. The Aquitanian language was spoken on both sides of the western Pyrenees in ancient Aquitaine and in the areas south of the Pyrenees in the valleys of the Basque Country before the Roman conquest. It probably survived in Aquitania until the Early Middle Ages. The French Basque Country, or Northern Basque Country is a region lying on the west of the French department of the Pyrénées-Atlantiques. Since 1 January 2017, it constitutes the Basque Municipal Community presided over by Jean-René Etchegaray. Novempopulania was one of the provinces created by Diocletian out of Gallia Aquitania, which was also called Aquitania Tertia. The area of Novempopulania was historically the first one to receive the name of Aquitania, as it was here where the original Aquitani dwelt primarily. The territory extended within the triangular area outlined by the River Garonna, the Pyrenees and the ocean, as described by Caesar in De bello gallico for Gallia Aquitania. In his work, Caesar describes the Aquitania as being different in language and body make-up from their northerly neighbours and more similar to the Iberians. The province of Aquitania was enlarged by Augustus, and it began to signify a larger and more diverse territory. The Elusates were an Aquitani pre-Roman tribe settled in what today is southwestern France, in the northeast of the Aquitaine territory, around the city of Elusa, which is present-day Eauze, in the French department of Gers. They were subdued by Publius Crassus, legatus of Caesar in 56 BCE. The Tarbelli were an Aquitani pre-Roman tribe settled in what today is southwestern France, in the region between the river Adour and the Pyrenees. The capital of the Tarbelli people was Aquae Tarbellicae, present-day Dax. They were the ancient inhabitants of Labourd, in the Northern Basque Country, in the present-day French department of the Pyrénées-Atlantiques. The Ausci were an Aquitani pre-Roman tribe settled in what today is southwestern France, in the city of Elimberrum or Eliberris, present-day Auch in the French department of Gers. The Ausci spoke a form or dialect of the Aquitanian language, a precursor of the Basque language. The Bigerriones were an Aquitani pre-Roman tribe settled in what today is southwestern France, around the city of Castrum Bigorra, present-day Saint-Lézer and Civitas Turba, present-day Tarbes. The Bigorre region is named after this tribe. They are mentioned by Julius Caesar in his Commentarii de Bello Gallico, where he mentions how the peoples from Aquitaine were subdued by Publius Licinius Crassus. It is believed the Bigerriones spoke a form or dialect of the Aquitanian language, a precursor of the Basque language.